Laura Fritz, 27, said she grew up in a wealthy family, but their fortunes changed. 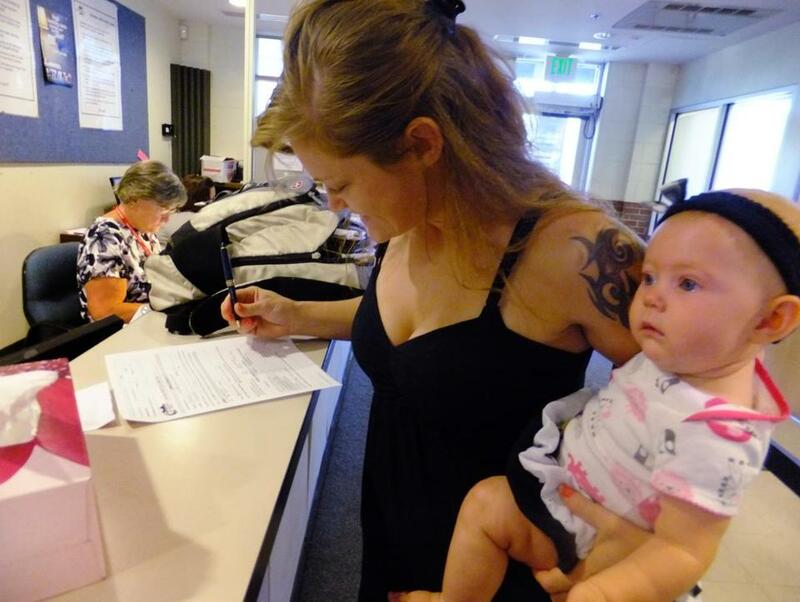 Fritz, shown with her daughter, filled out forms at an assistance center outside Denver recently. WASHINGTON — The ranks of America’s poor are on track to climb to levels unseen in nearly half a century, erasing gains from the war on poverty in the 1960s amid a weak economy and fraying government safety net. The Associated Press surveyed more than a dozen economists, think tanks, and academics, both nonpartisan and those with known liberal or conservative leanings, and found a broad consensus: The official poverty rate will rise from 15.1 percent in 2010, climbing as high as 15.7 percent. Several predicted a more modest gain, but even a 0.1 percentage point increase would put poverty at the highest level since 1965. Poverty is spreading at record levels across many groups, from underemployed workers and suburban families to the poorest poor. More discouraged workers are giving up on the job market, leaving them vulnerable as unemployment aid begins to run out. Suburbs are seeing increases in poverty, including in such political battlegrounds as Colorado, Florida, and Nevada, where voters are coping with a new norm of living hand to mouth. ‘‘I grew up going to Hawaii every summer. Now I’m here, applying for assistance because it’s hard to make ends meet. It’s very hard to adjust,’’ said Laura Fritz, 27, of Wheat Ridge, Colo., describing her slide from rich to poor as she filled out aid forms at a county center. Since 2000, large swaths of Jefferson County just outside Denver have seen poverty nearly double. Fritz said she grew up wealthy in the Denver suburb of Highlands Ranch, but fortunes turned after her parents lost a significant amount of money in the housing bust. Stuck in a half-million dollar house, her parents began living off food stamps and Fritz’s college money evaporated. She tried joining the Army but was injured during basic training. Now she’s living on disability pay, with an infant daughter and a boyfriend, Garrett Goudeseune, 25, who can’t find work as a landscaper. They are struggling to pay their $650 rent on his unemployment checks and don’t know how they would get by without the extra help as they hope for the job market to improve. In an election year dominated by discussion of the middle class, Fritz’s case highlights a dim reality for the growing group in poverty. Millions could fall through the cracks as government aid from unemployment insurance, Medicaid, welfare, and food stamps diminishes. ‘‘The issues aren’t just with public benefits. We have some deep problems in the economy,’’ said Peter Edelman, director of the Georgetown Center on Poverty, Inequality and Public Policy. He pointed to the recent recession but also longer-term changes in the economy such as globalization, automation, outsourcing, immigration, and less unionization that have pushed median household income lower. Even after strong economic growth in the 1990s, poverty never fell below a 1973 low of 11.1 percent. That low point came after President Lyndon Johnson’s war on poverty, launched in 1964, that created Medicaid, Medicare, and other social welfare programs. The predictions for 2011 are based on separate AP interviews, supplemented with research on suburban poverty from Alan Berube of the Brookings Institution, and an analysis of federal spending by the Congressional Research Service and Elise Gould of the Economic Policy Institute. The analysts’ estimates suggest that some 47 million people in the United States, or 1 in 6, were poor last year. An increase of one-tenth of a percentage point to 15.2 percent would tie the 1983 rate, the highest since 1965. 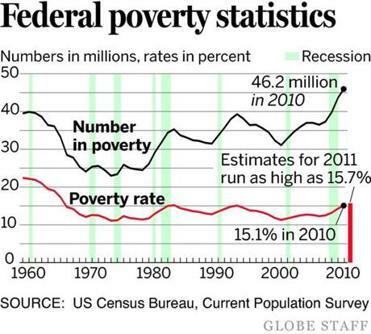 The highest level on record was 22.4 percent in 1959, when the government began calculating poverty figures. Demographers also say poverty will remain above the prerecession level of 12.5 percent for many more years. Several predicted that peak poverty levels — 15 percent to 16 percent — will last at least until 2014, due to expiring unemployment benefits, a jobless rate persistently above 6 percent, and weak wage growth. It excludes capital gains or accumulated wealth, such as home ownership, as well as noncash aid such as food stamps and tax credits.